There’s very little need for an introduction to the career of Smarty Jones, who was the biggest people’s champion of the 21st century. He won the Pennsylvania Nursery Stakes at then-Philadephia Park against fellow PA-bred by a commanding 15 lengths before going on to stay undefeated and capture the first two legs of the Triple Crown. His lone loss was in the Belmont before an early retirement prematurely ended his racing career. How does the Monmouth form of several contenders carry over to Parx? Monmouth and Parx are very different surfaces, with almost the opposite bias. The switch could very well help some horses and hurt others, depending on their style. Albano and Just Call Kenny both recently ran in both the Haskell and the Pegasus and, if the speed transfers or improves, are very serious win contenders. How much will Classic Giacnroll appreciate being at his home track? As Ainslie points out (as discussed in All Day Racing Talks), running at a horse’s home track, when the horse is otherwise a contender, can be a significant advantage. If he does, he certainly figures as an strong off-the-pace threat. Is Ain’t Got Time’s last race repeatable? It was fast, but it was also likely misleading. Easy front-running score at a much easier level on a different surface at Delaware. Who will appreciate the slight cut-back in distance? Several horses ran longer in difficult company last time out and now run at a little over a mile (around 8.3f). The extra stamina may prove vital in the stretch of a tiring track. Protonico, Just Call Kenny, Joint Custody, Albano, and Classic Giacnroll all ran 9 furlongs last time out. Will Protonico improve off of his solid effort in the Curlin Stakes and what effect will the re-addition of blinkers have? The Curlin Stakes produced the Travers winner in V-E day, who moved forward significantly off that race. Protonico has been consistent twice-out for Pletcher, but a bit too slow to find winner’s circle without improvement. Pletcher puts the blinkers back on today, a move that doesn’t inspire much confidence based on his limited track record (0 for 11). Albano certainly stands out on paper. He was solid throughout the winter and was dominant in the Pegasus. It’s tough to accept less than 3-1 on him, though, and I think he’ll be lower than that. At a price, I’m interested in Classic Giacnroll at home and the lightly-raced Just Call Kenny, with the sizzling Paco Lopez aboard. I’ll take a stand against Protonico, who will likely be overbet with the connections and also the inconsistent Almost Famous. Check out the 1st episode of All Day Racing Talks here. 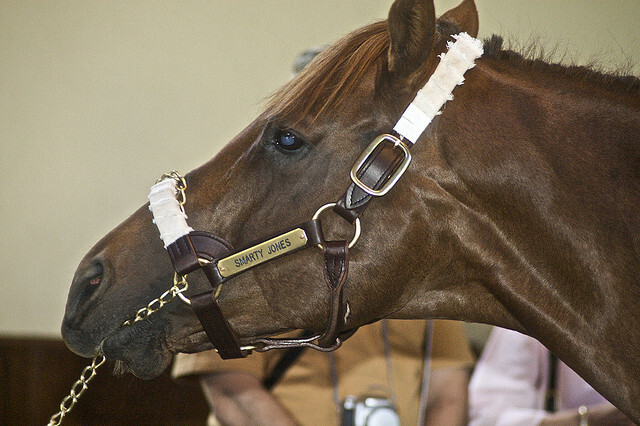 Image: Jean, Smarty Jones, Copyright 2009.